You’ve all heard of the Magic Bullet Express blender, especially if you watch any late night TV. There was a time when their infomercial was everywhere. From our analysis it seems that the Magic Bullet Express delivers on many of its promises and is a really nifty little blender. The problems though seem to lie in its durability. 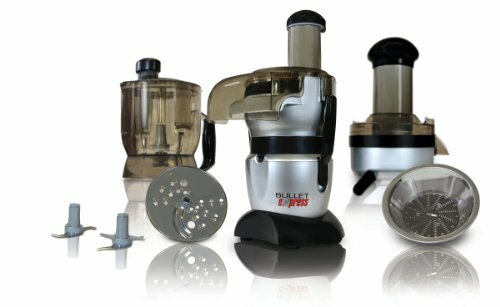 If you use the Magic Bullet Express blender exactly as prescribed in the manual, and keep it cleaned and maintained well, and don’t run the engine too long (over 30 seconds), then it will last you a good while (hopefully at least a year). However, if you like to load it up with hard to blend ingredients (peanut butter, big chunks of ice, nuts, etc.) then you’ll likely be disappointed. Basically you can’t treat your Magic Bullet like you would a standard size counter top blender and beat it around. It’s not going to blend a cell phone like a Blendtec blender, but it will set you and your friends up with smoothies. With that in mind, if you like the convenience of being able to pack your ingredients into a cup, blend using that cup, and then take it with you to go, with a nice travel lid, then the Magic Bullet is a good buy. If you need more quantity and will be blending thick soups and potatoes that will require more than 30 seconds of blending time, then you’ll need to look elsewhere. As a small personal blender, we give the Magic Bullet Express blender a 3.5 rating, but as a standard kitchen blender it’s more like a 2.5. Easy to clean – The Magic Bullet Express blender is dishwasher safe and the cups are just as easy to clean as any standard cup you would use in your home. Stable – To make the blender power base work, you have to press down on the top of the cup. Since you have to hold your hand there to keep the power on, the blender won’t move about and stays very stable. Precise control – You can pulse or you can blend for longer by pushing down on the top and taking pressure off as needed. Good pitcher – You get multiple cups of different sizes with the Magic Bullet, all of which are dishwasher and microwave safe, and they can be put in the refrigerator. Short lifespan – the durability on the Magic Bullet Express blender seems to be iffy. Poor motor design – the motor can overheat and is prone to breaking down. The other Magic Bullet blender is the Deluxe version. It has 22 pieces and comes with a handy carrying case for easy transport. You can read our blender review of the Magic Bullet Deluxe. 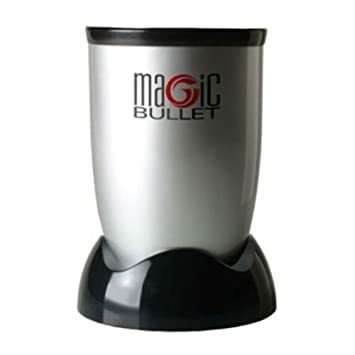 High-Torque Base – The 17 piece Magic Bullet Express comes with a power base that works with all of the Magic Bullet attachments. To start the engine you simply press down on the cups that fit onto the base. 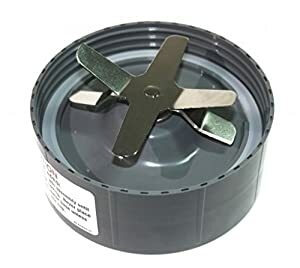 Flat-Blade and Cross-Blade – The Magic Bullet Express has two types of blades that come with it, a flat blade that is used for harder food grinding like with coffee beans and nuts, and a cross blade that is used for grating and chopping ingredients like meats, cheeses, and vegetables. Both stainless steel blades are strong, dishwasher safe, and won’t need to be sharpened. Short and Long Bullet Cups – You get a tall cup and a short cup with the Magic Bullet Express. The short cup is best for smaller portion items, like dips or salsa, and the tall cup is good for smoothies and drinks. Both cups are dishwasher and microwave safe. You can easily blend your meal, cook it in the microwave, and store what’s left in the cup, in the fridge. Party Mugs (4) with Lip Rings – With these extra party cups you can serve four others their own personalized smoothie or cocktail without having to clean a large blender jar. The comfort lip rings are colored so that everyone knows which drink is theirs. Shaker/Steamer Tops – Just pop these tops onto the Magic Bullet cups and you can serve food right from the blender to the table. You can also steam foods right in the microwave. One top has large holes which are used to shake out larger ingredients like Parmesan cheese, and the other top has smaller holes for spreading finer ingredients like nutmeg or cinnamon. Re-sealable Stay Fresh Lids – it’s easy to store your leftovers and keep them fresh with these lids that fit securely onto both the short and long cups. You can just blend, eat or drink what you want then pop on the cap and stick them in the fridge. 10 Second Magic Bullet Recipe Book – This 100 page recipe book has every recipe shown on the Magic Bullet Infomercial. It also has tricks and tips on using the Magic Bullet blender. Recipes include breakfast, gourmet dinners and delicious desserts, as well as frozen drinks, all made in 10 seconds or less. There are a lot of Magic Bullet blender reviews – over 600 on amazon.com alone. We know you don’t want to read through all of those reviews, so we’ve highlighted the most helpful reviews here to try to help you in your decision making process. Everyone seems to like the ease and convenience of the Magic Bullet. For single serve situations it also great. It is also mentioned that you need to read the manual before using this product. It tells you what to do in case food gets stuck when blending, and how to pack ingredients in the blender cups. Several reviewers also say that you can prevent overheating of the engine if you don’t keep it running more than 30 seconds, which should be sufficient to blend almost anything you need to. Many owners also like that the cups and the blades of the blender are really easy to clean. Also all of the cups and caps that you get with the blender are strong favorites. There are numerous reports of the engine on the Magic Bullet dying out quickly. Owners also talk about the Magic Bullet being low quality, poorly made, and not lasting long. Most think that they are great out of the starting gate but simply fail within a year. They are covered under warranty for a year, but getting replacement parts is apparently very hard, and the customer service at Magic Bullet sounds very poor.